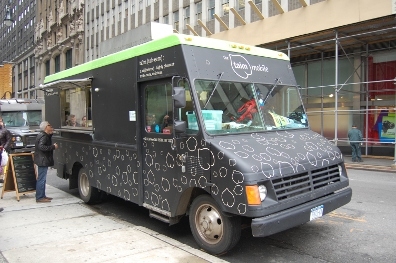 Late last year, Taim started to offer falafel on the streets of NYC in addition to their brick & mortar location in the West Village. I’ve been wanting to get Taim falafel ever since that day. One of the corners of the truck reads the definition of the Hebrew word taim, “highly pleasant to the taste, delicious.” I agree completely. Since I was in the city during the week it was my goal to order the harissa falafel sandwich this time since I had green last. The sandwich comes with the falafel, hummus, Israeli salad, pickled cabbage, and tahini. Fantastic. It was even better than what I remember! Falafel had a crisp outside with a just spicy enough center and wasn’t dry. The truck unfortunately only has the green falafel daily. 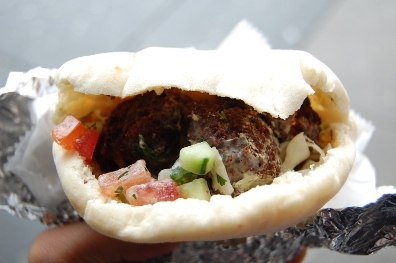 The harissa was on special when I went and this week it’s spinach & jalapeno falafel! It sure sounds pretty good! You can see their weekly schedule on their website or follow them on Twitter!